Welcome to Nelson Mandela Quotes. 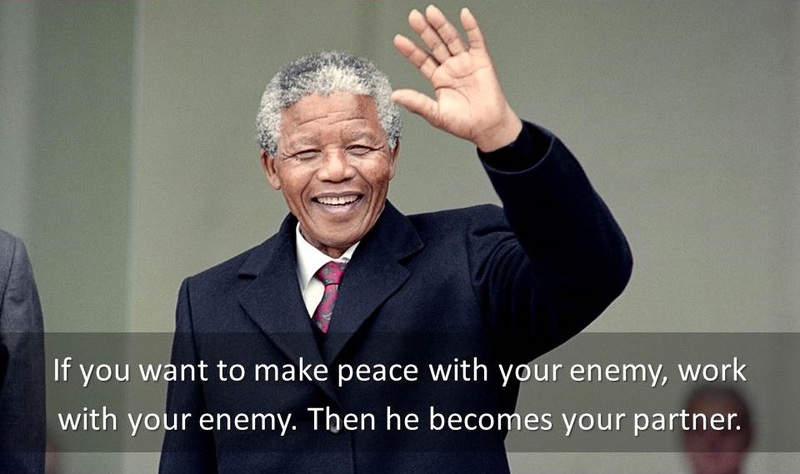 Here you will find famous quotes and quotations by Nelson Mandela. Life is a course with endless obstacles to hurdle. Courage is not the absence of fear — it´s inspiring others to move beyond it. Keep your friends close — and your rivals even closer. Know your enemy — and learn about his favorite sport. An ode to the fact that racism is not passed on genetically, but passed on through teachings. From the poorest of countries to the richest of nations, education is the key to moving forward in any society. There was no particular day on which I said, Henceforth I will devote myself to the liberation of my people; instead, I simply found myself doing so, and could not do otherwise. I am fundamentally an optimist. Whether that comes from nature or nurture, I cannot say. Part of being optimistic is keeping one's head pointed toward the sun, one's feet moving forward. As I have said, the first thing is to be honest with yourself. You can never have an impact on society if you have not changed yourself... Great peacemakers are all people of integrity, of honesty, but humility. I had no epiphany, no singular revelation, no moment of truth, but a steady accumulation of a thousand slights, a thousand indignities and a thousand unremembered moments produced in me an anger, a rebelliousness, a desire to fight the system that imprisoned my people. Overcoming poverty is not a task of charity; it is an act of justice. Like Slavery and Apartheid, poverty is not natural. It is man-made and it can be overcome and eradicated by the actions of human beings. Sometimes it falls on a generation to be great. YOU can be that great generation. Let your greatness blossom. We are too quick to give up and refuse to get up from our failures. If we don’t fight to get up, we are giving up on something bigger — life.